As is traditional during Camp Gramp, I repurpose my mother’s updates on how the four cousins are doing as content while I vacation. I used to actually write often enough that this saved me some writing. But now I know there are ardent Camp Gramp fans out there who I swear just read my blog to get the goods from my mom! Camp Gramp has officially started. It had an unusual start. People have been here for 4 days, but Brenda and Adam left for Ashland today, so it is just the two generations. We decided to go to the Morton Loggers’ Jubilee. We saw the toppers climb 80 ft in the air with the axe hanging from their belt. Then they topped the log. We saw the Hot shot chain saws, and hopefully prevented hearing damage. The two person buck saws were fast and we watched people use their axes standing on a buckboard. Parents, you will be pleased to know that each family now has a souvenir. (Editor’s Note: I’m hoping to get Adam to turn our souvenir into a table.) Let me know how you want me to ship it to you! There was a competitor from Golden Valley, MN, and one from Australia! This evening we hope to watch “Bill and Ted’s Excellent Adventure” and do the crossword puzzle. We are enjoying the new projector and the screen which is larger than it ought to be! Thanks to the kids for joining us. It is great fun! Today was the tour of the Boeing plant in Everett, Pike Place Market, and the play area at the Center, plus a short visit to Del. The kids were GREAT! Cooperative and enjoyable. Clearly, I am failing in my picture taking. For the Boeing plant, I have an excuse. The allow no phones, even turned off and in your pocket, on the tour. That place is amazing. Largest building in the world, by volume. We were in the tunnels running the width of the building (1/3 mile wide), and on the 4th floor looking down at everything. We didn’t see many workers, but our tour guide assured us that they were there. The rest, I was too busy enjoying to take pictures. Kay bought a poster at the market and Baz some tea. They are on per diem, so of course we ate at McDonalds. We were going to do the Space Needle, but it was so hazy that you can’t see anything. We will take them when it clears up, if it clears up. Here are a few that I did take. There comes a point where you just shut down your computer on a Friday, and don’t open it up for a week. I hit that point. Man, did I need a vacation. I’m so grateful I’ve gotten it! Meanwhile, Camp Gramp is in full swing. Instead of the typical email updates, my mom has been posting Facebook updates. I can’t blame her for it, but in the interests of stealing her writing and using it as my own (hey, it’s not a vacation if I have to work, right?) I’m reposting here for your delectation! We are here! The tents are up! The sleeping bags are out! The children are happily playing. They are old enough now for some self-determination, so they have decided our destination in Canada will be Vancouver. The criteria is — a good science museum! Parents are raising these kids right! Two kids have outgrown their tents, and a third tent is on its last legs. We have two new tents and will need to replace a third. Today started with a bang. A flat tire. The van has a spare, but it is under the front seat and really hard to get to. We played old people and used our AAA. The nice young man had bad things to say about getting the spare out. I needed to go to town to get the tire fixed and visit the Group Health lab, so we gave the children a choice. Go to town and chase Pokeman Go or stay home. They chose stay home! They have been upstairs playing together much of the day. When they weren’t doing that, they were playing outside. This sounds like the MOST BORING Camp Gramp. But they are enjoying themselves. I think it is a sign of maturity. First, they can make choices themselves. Second, they can entertain themselves! It is like a Lan party for Matthew. Feed them and stay out of the way! Today is Gramama’s birthday. We spent a while at the lake with the boats. The children did a great job, no one got wet by accident. We did have an incident of a nest of bugs in the canoe, but otherwise, it was great fun. Swimming too. The cake was the work of the W. children! Hot enough to swim in Mineral Lake! Good think I sent this kid to three weeks of camp that included kayaking! Today was organic farm day. A colleague of mine has a new farm in Ashford and the kids spent a couple hours there. They met Otis the dog, and the chickens. They came home with some eggs they collected. The met the llamas and the alpacas. There was also hay climbing and chicken chasing. Then the evening was spent on Mt. Rainier at a Star Party. Sebastian was a helper, keeping the moon in the telescope. It was great, but very late when we got home. Fortunately, they all woke up enough to get out of the car and go to bed. Mom and dad finally made it to their own beloved bed last night! It is a good 24 hours when you score 3 magnets! 3 of them! Bad Lands — we have been there before, but never done the loop drive. Well worth the time. We then went to our hotel, got dinner, and went back to the park. I hiked a little bit, then we sat in the car and watched the stars come out. We think the howling was coyotes! It was awesome. The hotel was not. I didn’t even know they still had smoking rooms. Tonight I put on my PJ tops and then took them off. They smell like smoke! It was in Wall, SD — the last week in July. For the unknowledgeable, don’t go there in the end of July or the beginning of August. Sturgis! This morning was Mount Rushmore. My oh my! They have really done a good job of crowd management, but 20,000+ visitors a DAY. It was crowded. We saw the mountain, Watched the movie, visited the museum, they bought the magnet in the world’s largest tourist trap shop! Then on to Wind Cave. It was the 7th national park and we hadn’t heard of it. I took the cave tour in front of a man from France. A fellow tourist was narrating the whole thing for him is great French. That was fun to listen to. When I grow up, I am not going to explore caves! Then, we bought the magnet! It was an eye candy day. Wyoming is really beautiful. We had a lovely time. 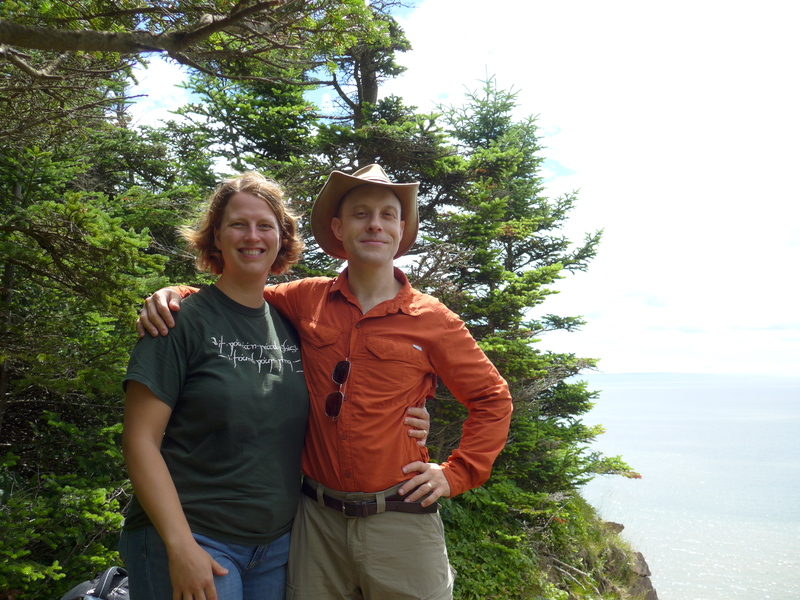 While my parents and children were off exploring colonial America (and being Very Hot in the process), Adam and I took an alternate track and went up North to the Bay of Fundy. I struggled quite a bit with what to do this vacation. I knew it would be happening, as it’s a crying shame not to go on vacation with your spouse when your parents are taking your children for a week. For a while I dabbled with the South of France, but after a very lovely month off and tropical island vacation between jobs, that seemed a touch financially irresponsible. (Tragically. Still saving it for next time.) So then I figured we’d go camping in Canada. You know – like the White Mountains only with Tim Hortons. I did not very much research, no prebooking, and very little planning. I knew I wanted to see the Joggins Cliffs. I knew the Bay of Fundy was internationally renowned for have the world’s largest tidal differences. I knew it was a Dark Sky preserve. And I knew it was in Canada. On this vast wealth of knowledge we went on vacation. On Friday we went to a very swank French restaurant in Boston (the meal there may have cost us as much as the rest of the week put together) and walked across a glowing Boston back to where my car was parked at my office in Cambridge. Then Saturday we packed and headed north. The first night we spent in Bangor (which might be the first time I’ve ever used rewards miles for anything). 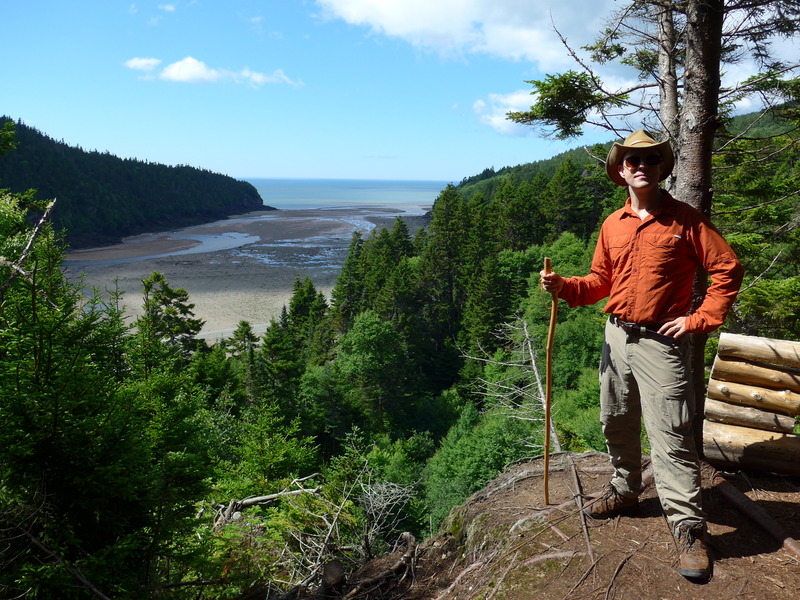 The second day, we listened to podcasts and hit the Bay of Fundy National Park. We went to the middle of nowhere, took a right, and drove for another hour on mosquito-ridden roads to get to Point Wolfe Campground. I’d picked it because it seemed rural, tent-focused, and was right near the bay we’d come so far to see. You are seeing four campsites in this picture. It was also, it turns out, crammed cheek-to-jowl and lit with obnoxious street lights. (Which seriously – National Park in a dark sky reserve with street lights?!?! What are you thinking, people?!) 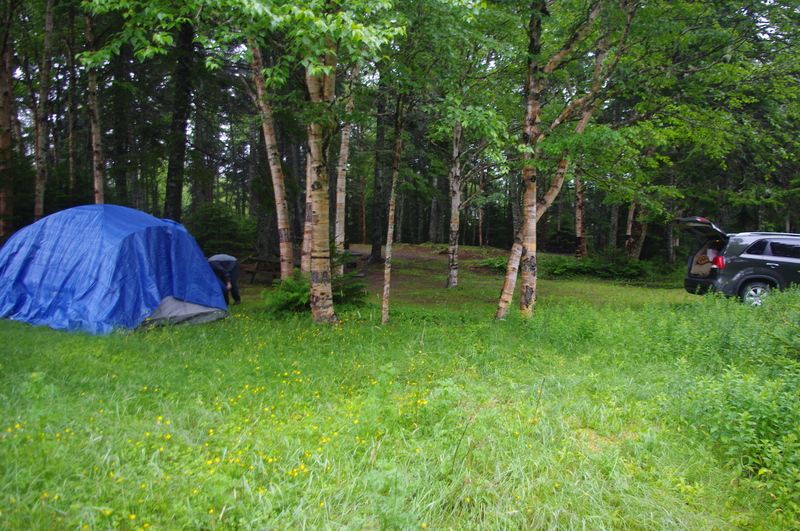 The sites were also often too small for us to pitch our (granted – enormous) tent on. We picked the least bad site and thought dark thoughts about switching campgrounds, although we were too lazy. We thought it looked like Venus, or some other planet. That first night we came in was beyond foggy. We kept driving past these viewpoints that claimed to be veiwpoints that were really fog-points. It started raining almost as soon as we entered Canada, and not a day on vacation was without its precipitation. But that first night was the foggiest. We went down the trail in the dying light to the Wolfe Point beach. We walked and walked on slick rocks and red clay and never found the ocean – it was too far out. Our shoes and pants were covered nearly to the knee in the reddest of clay. 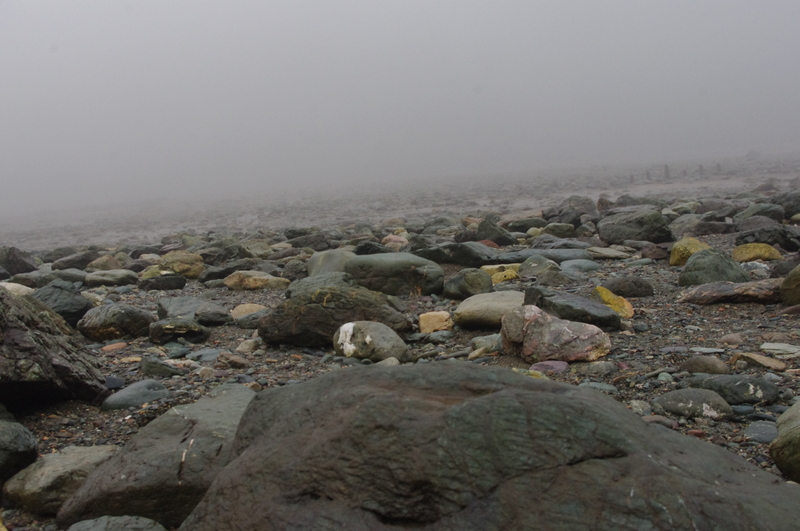 It was otherworldly in the mist, as we could not even hear the sound of waves and mountains appeared and disappeared to our right and left. As we slept that night, raindrops fell on our head through the thin cover of our tent-sides. 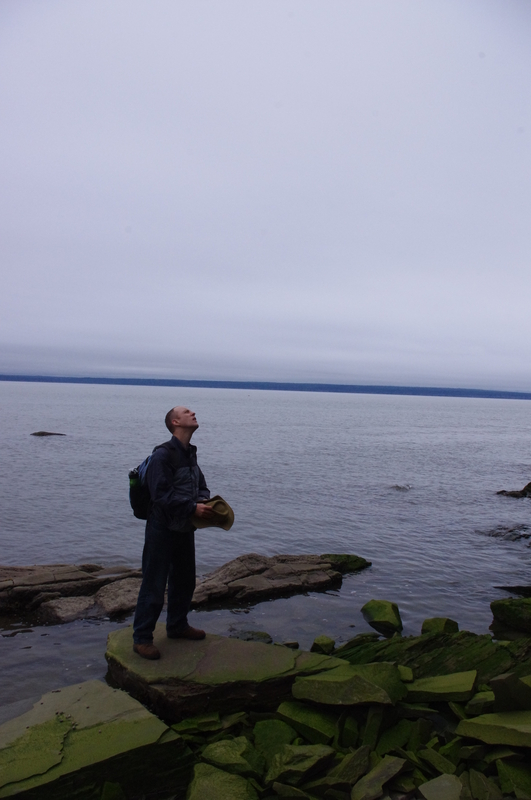 On Monday we went to Cape Enrage. With the timing that evinced my careful preparation and thought, we were there at high tide (which meant we couldn’t see very much). We opted not to do the zip line or rappelling, but we spent a long time sorting through rocks finding all manner of 320 million year old fossils. We thoroughly enjoyed the treasure hunt of finding the fossils. In fact, so much of my photography of this journey was fossil-related I have an entire album of fossils from Cape Enrage and Joggins Cliffs (penultimate day) which you can see here. We also got some dulse. Gamers beware. It should be noted that someone (who would that be?) quite literally did not think for a minute about the well known fact that our cell coverage does not extend to Canada. We grabbed 15 minutes of wifi a day by parking outside of the National Park headquarters, and once or twice dining in establishments that offered free wifi. We navigated with actual paper maps and brochures. How very odd it was! Tuesday we went sea kayaking. Given that we’d come so far to see these cliffs and tides, this seemed like the thing to do. Fun fact: sea kayaking is quite a workout! 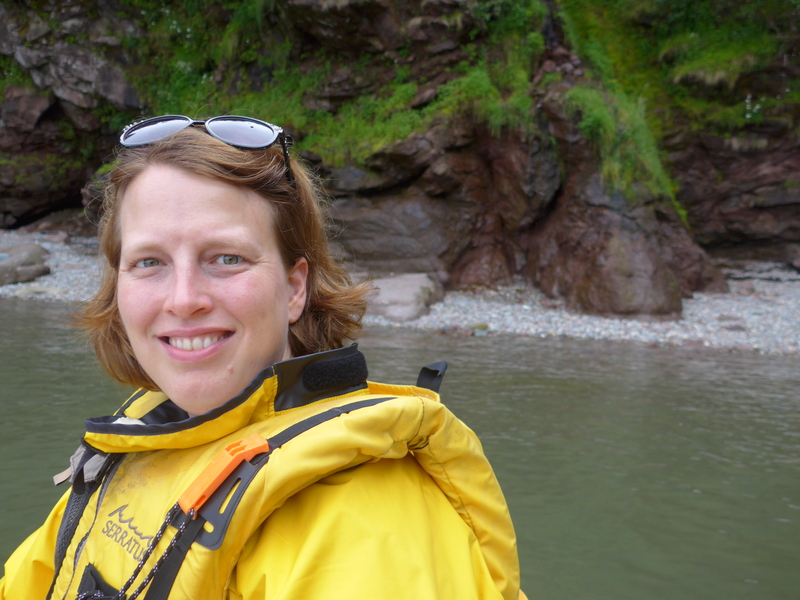 We didn’t turn over (there are hardly any waves that we witnessed in the Bay of Fundy, although we saw dolphins twice). We did manage to keep up with all the appallingly energetic Quebecois couples with their teeny French-speaking children who went on the tour with us. Mostly. 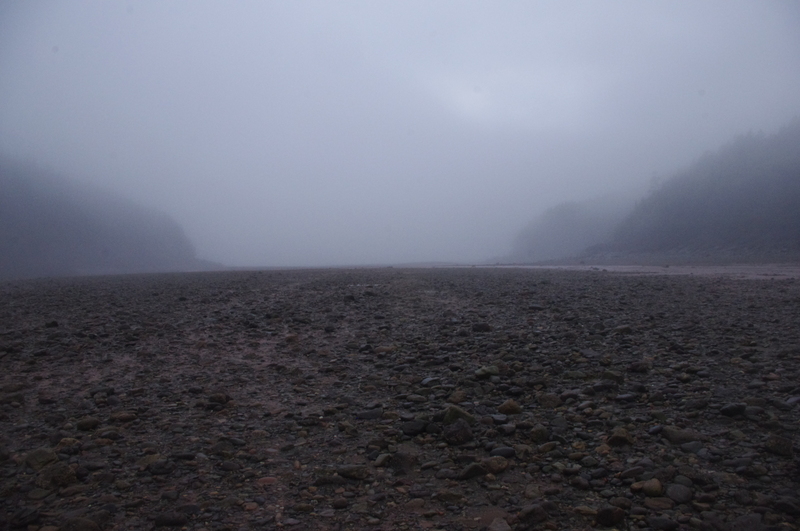 It was a really lovely trip on what we were assured was a “beautiful warm” day on the Bay of Fundy. By which they mean light rain and mid-60s. Man, those are some muscles I don’t use often. But it was a lot of fun! The tilted strata were so very clear. Apparently further down the coast than we could go with the tides stand 320 million year old trees where they first grew. Wednesday I thought far enough ahead to plan for a day that involved a lot of sitting. It also involved thunder as we drove through Moncton. 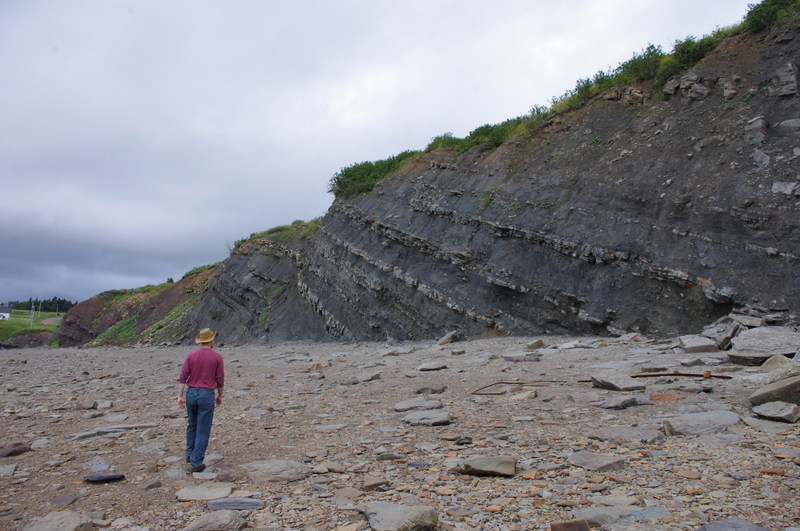 We arrived at the Joggins Fossil Cliffs after a long drive and several outlandish theories about Nova Scotia (supported by too few data points – eg “Nova Scotia is primarily inhabited by cows”). 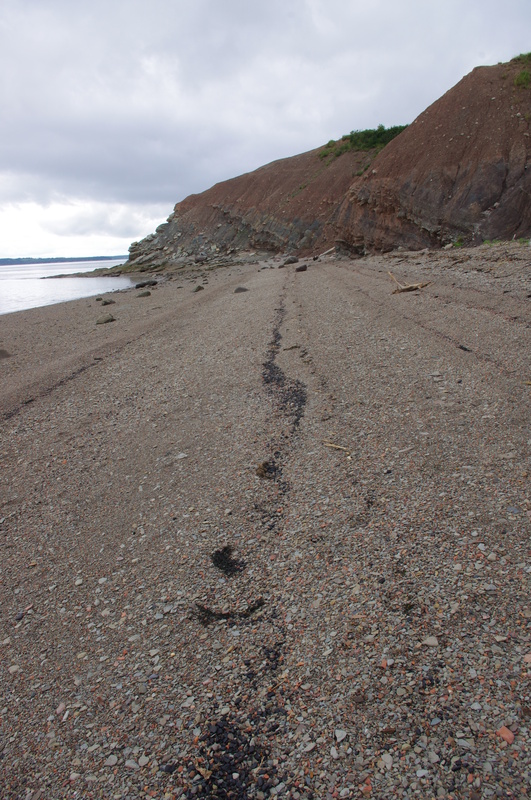 So here’s the thing about your Bay of Fundy vacation. 1) Be prepared for it to be cold, even during a heat wave in Boston in mid summer. 2) Be prepared for it to be soggy. See also #1. 3) Plan your trip around the tides. This was my favorite of the fossils we found, with shells embedded throughout it. But in this case, I tragically did not calculate the tides. One great thing I got out of this was a clearer understanding of how tides world. They go low to high every 6 hours and 18 minutes – based on where the moon is as the earth turns plus the fact that the moon is also in motion (that’s the 18 minutes). We got to Joggins 2 hours before high tide, just as the water was getting high enough to prevent us from getting to the coolest stuff. And four hours before it would be any lower than it was that very moment (at 3 pm, a 3 hour drive from our tent). We hunted the shore for neat fossils and found very many indeed – but I was really sad that we’d come so far in order to NOT see the famed standing trees which have stood where they took root for well over 300 million years. Trees that helped Darwin understand evolution. And they remained past a spit of land that the high tide kept from us. So close! That night, for the first time, we truly enjoyed the dark skies afforded us by being 100 miles from the nearest Starbucks. The Milky Way was as clear as though it was painted across the sky. The stars were close, glorious, beguiling, beloved. We stayed out, necks crooked, enjoying the brilliance of the archaic night sky. 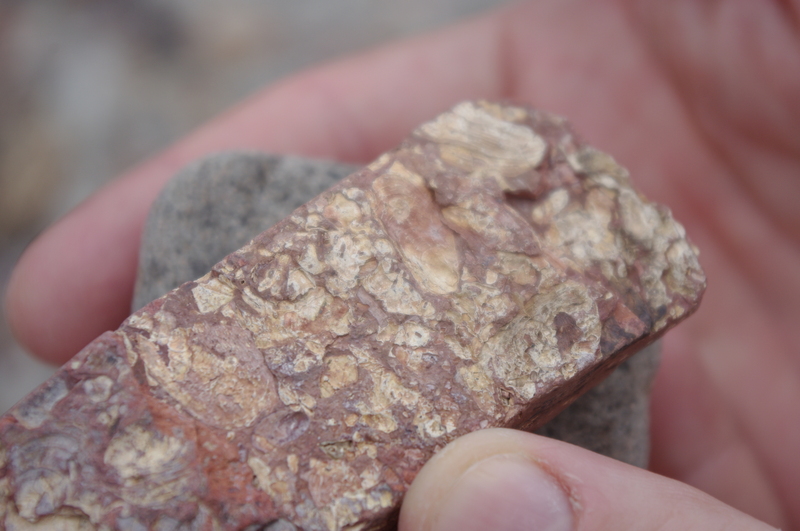 It’s quite literally a beach of priceless fossils, where at any moment a rock might fall and our understanding of early life on earth might change. By this time, we’d pretty much exhausted the entertainment options within a 2 mile drive. I mean, there were hiking trails. And, um, er… the Hopewell Rocks. We didn’t see those. It was a beautiful, lovely, restful place. But the combination of an inhospitable campground and not much else to do encouraged us to go home a wee bit earlier than originally planned. On Thursday, we awoke to a novelty. Sunshine. We grabbed the advantage to go on a hike. Now, Adam was nervous because the hike said “difficult”. When you take a “difficult” hike in the White Mountains (or even a “moderate”) you’re well advised to name your next-of-kin and carry a body brace in for the very likely event you break a leg falling off a cliff after being struck by lightening. I trusted this was more a “difficult” hike the way every other place I’ve been rated difficult and my confidence was rewarded. We hiked up these rain-forest hills along a bluff and to a spectacular lookout of the Bay. It looks almost cheery in the sunshine! LOOK! We even vacationed together! Then we crawled in the car and began the 10 hour drive home. It was a good vacation. It was restful. It opened the clogged arteries of the soul. We had a really good time being together, as we so often do. I crossed off a few bucket list items: sea kayaking, Joggins Cliffs, dulse, dragging my husband to Canada. But it was not a transcendently wonderful vacation in the way the Wonderland Trail, Istanbul, or even Ashland have been. Next time, I do more research. I did take many pictures!